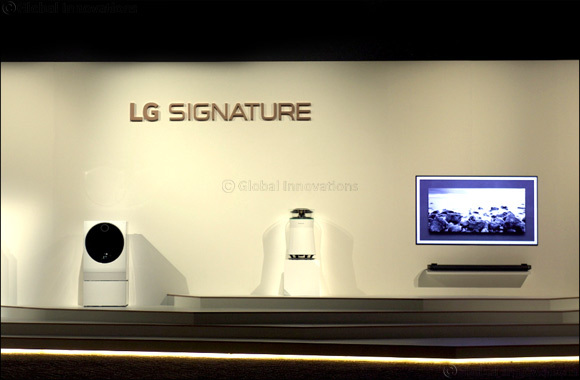 DUBAI, UAE, 24th January 2018: With the desire to create a better lifestyle for consumers, underpinning LG’s premium product philosophy, LG plans to continue pursuing an innovative, energy efficient and a premium product market strategy, positioning the company as a technology innovator with a flair for convenience, design and style. The company aims to accelerate premium product strategy by enhancing overall brand image and focus on profitable growth. Last year has been a solid year for LG that highlighted successful changes in preparation for a promising future, including organizational redesign for new businesses, reinforcement of modular design, and the enhancement of platform efficiency for R&D and manufacturing innovation. “According to a report from LG’s latest brand health tracking study, the Middle East & Africa have emerged winners under two critical brand index categories namely brand preference and price premium. LG has been ranked top among all other LG companies globally”, commented Jaewoo Sim, Marketing Director, LG Electronics, Middle East & Africa. From stylish, premium and most talked about LG SIGNATURE products, revolutionary OLED TVs, ground-breaking TWIN Wash washing machines, premium InstaView™ Door-in-Door® refrigerator, energy efficient products and everything in between, LG’s 2018 products combine the best of LG’s cutting-edge technology and world-class design with exquisite attention to detail for today’s most discerning consumers. In 2018 the company plans to concentrate on achieving recognition as a true premium brand by launching leading products that can drive change in the market. Globally, the company will continue to adopt next-generation technologies such as artificial intelligence and big data in business and management practices, and expand collaborative efforts with other organizations to create a system that can reinforce leadership in the era of convergence. LG’s proprietary deep learning-based AI technology is in line with the company’s efforts to speed up the release of new products with the latest technology. With innovative AI platforms such as LG ThinQ, the “live and learn” philosophy requires machines to educate themselves and become smarter over time. LG’s latest premium products highlight the true extent of LG’s innovation leadership and the company’s passion for consumer-centric insights that drive the evolution of life. Leading experts continue to carefully craft and create exquisite products by undergoing a strict in-depth evaluation process to make every product feel like an extension of every individual in order to help them create some exceptional experiences. “In line with our global vision of envisioning a future together with our customers, with aspiration for a better life and as part of the ongoing efforts to enhance durability and reliability, we will continue to enhance service capability under the LG Delight SVC”, said Jaewoo Sim. Last but not the least, the brand tracking report has also highlighted the Middle East & Africa consumers perceiving LG as a very innovative, modern, and reliable brand and keeping upto the dynamics of the region. LG’s latest products are created with a striking design that is practical and visually appealing to communicate elite status while opening the doors to a new era in home appliance and home entertainment segment.